Built for Zero Canada community Saint John, NB, armed with no more than rent supplements, partners sitting around a table and a By-Name List, housed 22 people in a three-month pilot project. This blog is a part of our Bright Spot series highlighting outstanding work in ending homelessness happening across Canada. Instead of opening cold-weather shelter services that inevitably put people back on the street by springtime, 22 formerly homeless people fast-tracked out of shelter through a pilot project in Saint John, New Brunswick now have a permanent place to call home. As more and more cold-weather shelters opened up for the winter in New Brunswick, the folks in Saint John decided to go in a different direction. Instead, they housed 22 people, including individuals, couples and families, with 15 rent subsidies in just three months. And they’re hoping the rest of the province takes note. The decision came out of a November 20 meeting over what their response would be for the coming winter, according to Michael MacKenzie, with the Human Development Council. When temperatures drop, more pressure is put on emergency services by a surge of people experiencing homelessness seeking sanctuary from the extreme and dangerous weather. So instead of the usual ask for temporary cold-weather shelter funding, the Built for Zero Canada community asked for rent supplements and funding to hire support staff to transition people out of the shelter and into units of their own. A pilot project was born out of a collective effort between the city’s emergency shelters (Outflow Men’s Shelter and Coverdale Centre for Women) and other agencies such as Fresh Start Services for Women and Housing Alternatives Inc., which operate outreach services and the city’s Housing First program. The province’s Department of Social Development agreed to provide the 15 rent subsidies. One week after the meeting, the group started to put together a By-Name List (BNL) of people experiencing homelessness in their community. Within weeks, they had more than 60 names on the list. By Christmas Eve, they helped their first person move into a new home. “It was really quick, but I think for us, we’ve been talking about developing a By-Name List for a long time and developing a Coordinated Access System,” Michael says. “I don’t think we’re unique in this, but sometimes we get caught up in planning. We discussed it for so long thinking we’d have to have it all figured out before developing the list—but the crisis came about, and we just needed the list. That “bias for action,” Michael adds, was encouraged through Built for Zero Canada. 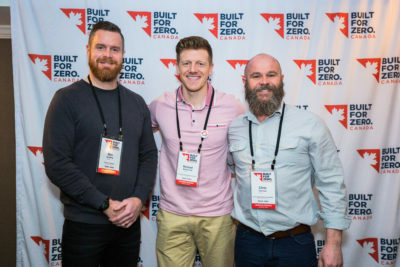 “It’s about getting names on a list and figuring it out as we go.” Built for Zero Canada supports communities to have real-time data on their chronically homeless population (BNL) and develop a Coordinated Access System, which is a way for communities to design, streamline, and bring consistency to the process by which people experiencing homelessness access housing and services. But it wasn’t easy, says Chris Gorman, also with Saint John’s Human Development Council. “Looking back at it now, I can’t imagine taking any different approach,” he adds. The group met weekly and agreed on the BNL criteria. Usual roadblocks were overcome because people quickly saw the benefits of helping the person at the top of the list instead of advocating for their own client. Instead of five groups lobbying for the same rent subsidies, they were working together. “For all of us, it worked more efficiently,” Michael notes. “People saw how much more effective it was to discuss, collect information, and prioritize based on the score and all those types of things. When the changes on the ground became more visible to everyone involved—from service providers to clients—when someone heard their name was on the list, it gave them hope. “When one woman heard people were working on her behalf to get a unit for her it boosted her,” Michael says. She had been living in shelter for over a year, Chris adds. Ben Appleby, Housing Coordinator with Housing Alternatives, says because everyone met weekly and all together, information was shared more quickly and effectively. They would not have known the woman was in shelter for a year, and they could provide updates on how she was doing, which helped fast-track her to the top of the list. Now that the pilot project is over, the group is focusing their efforts on adapting it for the long-term. That means ironing out their BNL and Coordinated Access System. They’re working on bringing in more partners and have asked the province for appropriate funding to ensure the success they saw in a three-month pilot continues into the future. The idea is to have the province step up to the plate to coordinate with federal funders as well, so the Saint John model is set up and hopefully ready to be taken on across New Brunswick too. This blog is a part of our Bright Spot series highlighting outstanding work in ending homelessness happening across Canada.